We definitely had a gorgeous guide (of course!) along with some goulash soup and what else? A shot of vodka for success! Completely exhausted, we headed off to Contiki's own gasthof in Tyrol. We relaxed for a bit that night before giving business to the Silver Bullet Bar in the local town. This excursion and the Moulin Rouge have been by far the best! We've been sleeping no more than 5 hours each night. I usually go to bed around 3AM and wake up at 7AM-I wouldn't have it any other way! The boat ride to Venice took about 20 minutes and the city is just spectacular. Perhaps the fact that it lies underwater makes it even more beautiful in its own way. I'm not a fan of pigeons at all, but St. Mark's Square just wouldn't be the same without them! I bought another shot glass at the Rialto Market to add to my collection as I have one from each country I visit. Venetian glass is classy as predicted and very affordable. We even watched a glass blowing show where a craftsman made a snail from hot glass in less than 2 minutes! Very skillful. Tip #5: Try the coconuts juiced with water from the fountains! They're not that tasty, but you just shouldn't resist the experience. Of course, one cannot visit Venice without a gondola ride! Apparently though, not all gondoliers sing. It is illegal unless one has a certified license and a professional accordion player with them. It's all part of Italy preserving its culture! Again, our amazing tour guide presented us with champagne for the ride! Yay for gondola rides and champagne! As our hotel was way outside the city, it was a stay-in night for the crew and me. Not to worry, the girls and I played, let's just say, an "interesting" game of Hot Seat! For those that don't know, when it's your 2-minute turn, everyone can ask you questions about anything. Everything is free game and you must answer honestly. GOOD TIMES! Venice, I will return and visit your museums when I have enough time to do you justice! After our adventures last night, we started the day with a very informative walking tour where we experienced the sights and sounds of Florence. The Church of Santa Croce and Arno River. Pretty! Afterwards, we spent the afternoon shopping where I bought a couple David Beckham jerseys for only 18 Euros (approx. 24 dollars). Of course, being in Italia, we had to try some GELATO! We hit up the famous Vivoli gelateria, one of the most popular, if not the most well-known gelato shops in all of Florence. Tip #4: Try at least 3 samples of flavors of gelato at whatever shop you go to! It's just too good to not. Oh, and remember to pay first and then give the receipt to get your ice cream. Common courtesy in most European countries. We then gathered under the Tuscan sun for a group photos with an excellent view of Florence at sunset. On top of the world...well, Florence at least! The dinner at La Certosa was wonderful! They started us all off with blue champagne cocktail that followed with soup and pieces of steak. We even saw a proposal happen in another Contiki tour! Afterwards, we all danced at the hottest night club in Florence, Space Electronic! One of the group members set us up with the VIP room overlooking the dance floor. Needless to say, it was sweet! We woke up early to get to the top of the Swiss Alps. Although cloudy, the sight was one to see. It was nice getting a breath of crisp, clear air! Top of the Swiss Alps and ridiculous high school pose! We then headed onto our Contiki coach for a three-hour ride to Florence. After a nice Tuscan dinner, our awesome tour guide surprised us with some complimentary limoncello. the girls and I HAD to sing some karaoke! 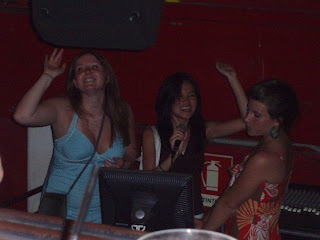 Singing Britney Spears' "Hit Me Baby One More Time"
We headed off down the street to dance all night at Club Twice. Liz Issac and I literally ran away from some agressive locals. Let's just say thank goodness I'm independent and can yell back like no other! Red Garter bar with some of my new favorite people! Best and craziest night in Europe so far! Switzerland: The land of chocolate and army knives. Friendly people and secret bank accounts. 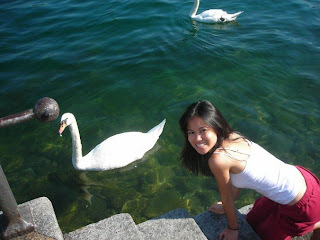 We walked across the famous Chapel Bridge and man, did I want to swim Reuss River! The water was so absolutely clear. The Reuss River. Once I find a partner in crime, I am coming back to swim here! show and had some delicious fondue. The greatest part of the night was going to Club Adagio. It has a beach theme and they actually bring sand into the club, so you can dance barefoot! Nice for the girls as we didn't have to deal with those cute, but hurtful shoes. Not too shabby, Switzerland! I like it. The first full day in Paris was FULL of sweet stuff and surprises! At the Louvre, a group of us looked at the Mona Lisa, Venus de Milo, and of course, had a photoshoot by the Inverted Pyramid that Tom Hanks ended up at during "The Da Vinci Code." Tip #3: Don't wait hours in line at the main entrance of the Louvre. Facing away from the museum and pyramid lies a large arch that leads to a basement. Save time and take the underground steps to enter The Louvre through the "secret" entrance. We hit up Notre Dame again and touched Point Zero, the center of Paris. Legend has it if you spin around on it, you'll return one day! Twirling on Point Zero to return to Paris! After a fantastic lunch (with nutella and bananas on crepes, of course), we went shopping on Rio de River--definitely bought some cute clothes at the Paris H&M! The best surprise occured at night when the whole group was taken to the Moulin Rouge! A dancer swam around with boas from acquarium that randomly popped up from underground, acrobats stood vertically head-to-head, gorgeous people wore gourgeous outfits--definitely a good time! A group of us ended the night clubbing by the Bastille! Although Latin Quarter was a hot spot, we hit up a local night club, Club Wax, with no cover and alot of American music! Good times! I will miss you, Paris! As I have spun around on Point Zero, I will return again and perhaps live here! After a 12-hour flight next to a retired, Indonesian businessman and then a French student (who taught me many phrases that I have forgotten by theis blog), two others on the same Contiki trip and I finally made it to Paris! After meeting about half the group, we were dropped off in the Center of Paris, where I ate crepes to my heart's content! Tip #2: Crepes and croques (ham and cheese on bread) MUST be tried in Paris. Although cheese and tomatoes are fantastic, crepes with nutella and bananas are THE way to go! My roomie, Jennie Tamyo, and the Eiffel Tower! Since we were with Contiki, we had VIP group tickets to the top of the Eiffel Tower. On the hour every hour at night, the Tower lights up for a magnificent light show. We actually were climbing down the stairs, so we got to be apart of all the sparkles! I think that I could live in this city...it's ridiculously romantic! I've met about 45 other people this morning and it's a complete ball so far. Stoked for tomorrow! The key to happy travels lies in packing light. No need to deal with waiting for baggage check-in, losing luggage, or most importantly lugging all that junk around with you-especially if you're travelling to 6 different countries. TIP #1: If you can't carry it, don't bring it! My travel buddies for 2 weeks. The backpack has accompanied me everywhere from school to Costa Rica. Notice the bungee clip on shoes-saves a ridiculous amount of space! Of course, in today's gernation, the young traveler must always carry a true necessity: the IPOD. EUROPE, HERE I COME! A bunch of college students who have never met and 2 unrestricted weeks in lovely Europa. Here's to an awesome adventure!